I've been making baked vanilla custard since I was a tween. That was when my mom developed a ruptured disc in her back and sporadically through my college days was on extended bed rest. During those periods when she was flat on her back I'd come home from school and go upstairs to my parents' bedroom, where my mom lay, help her into the prescribed corset that was attached to two heavy sandbags on a pole tucked into the end of their bed. With everything in place I'd carefully lower each sandbag, which had the effect of stretching her spine and relieving the pressure on the disc. That, my friends, was called "being in traction." 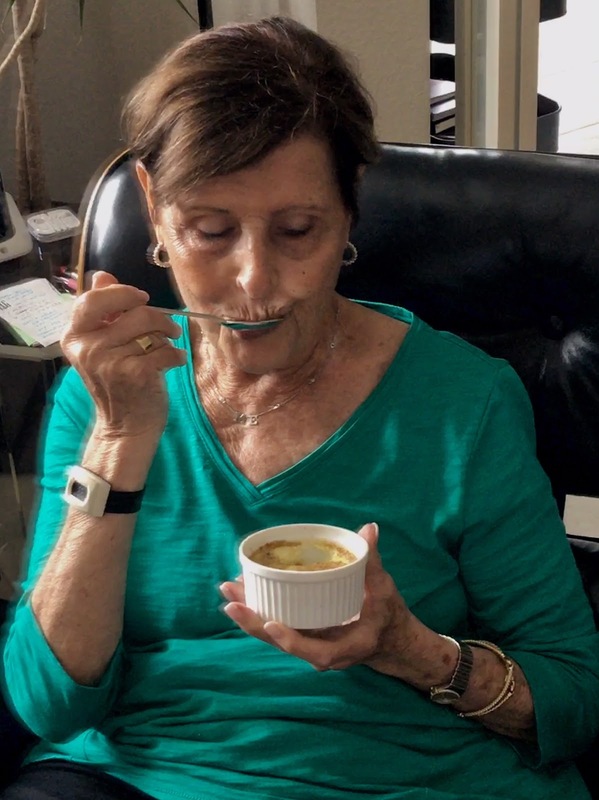 To get through these intervals, my mom was reliant on two things--small doses of valium (that's what was prescribed back then) and baked custard, which I'd make every few days after setting her up in traction. Everyone has their comfort food and custard is my mom's. Turns out it still is. Recently, she underwent oral surgery. The weekend before we talked about provisions she'd need while recovering from it. Mashed potatoes. Check. Smoothies. Check. Jello and pudding. Check. How about custard, I joked. Her face lit up. "I told my friends about how you used to make it for me when my back was out and hoped you'd ask me if you could make it." So, I am back to making custard. It was like muscle memory. It takes all of about five minutes to whip up. The waiting is in the baking--and my oven must be off because it took far too long for it to bake. But once it did, it was the same divine dessert I made regularly for almost 10 years, using a reliable recipe from Joy of Cooking. Once I got going on the baked custard I started contemplating the nature of custards. 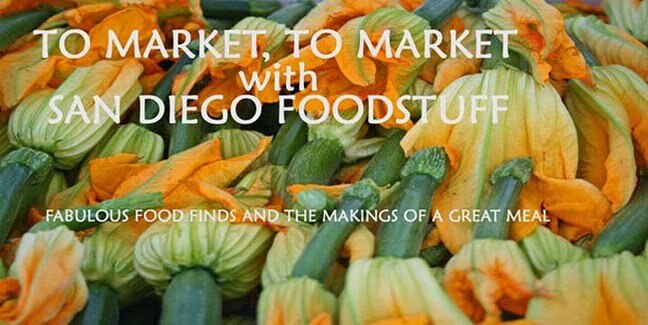 After all, this timeless mixture of milk, eggs, and sugar takes all kinds of forms--sauces, pie, flan, crème caramel, crème brûlée, sponge custards, pot-de-crème, floating island, and ice cream. Any of these variations lead to creamy comfort. They're the yin to mashed potato yang. Clearly someone who needed a hug from her mommy created the original dish. But, as with anything worthwhile, making custard comes with risks. With custards the primary risk is curdling. After all, you're introducing eggs to hot milk. But, when you make baked custard, everything starts at room temperature until you put the dish or dishes into the oven. 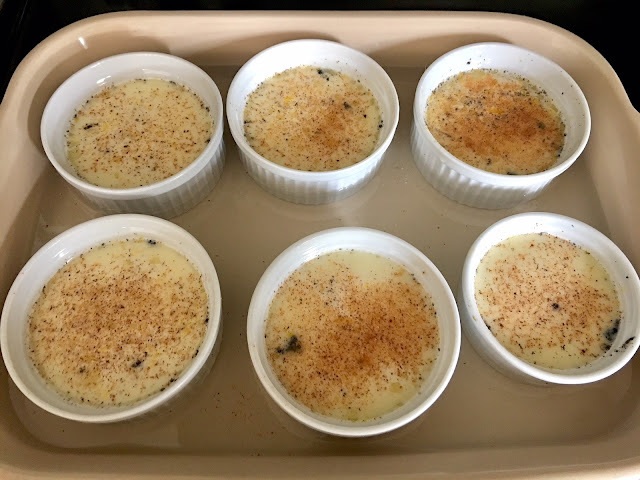 With baked custard you want to bake the custard in a bain marie, or hot water bath. It's simple enough. Pull out a baking dish or roasting pan just large enough to hold the custard dish or ramekins. Fill the latter with the raw custard and place them in the larger dish. Some people suggest lining the bottom of the larger dish with a towel. I never have and never experienced a problem. Anyway, carefully fill the large dish with very hot (some say boiling) water, without splashing into the custard. This helps the custard cook evenly. You'll place this carefully into the middle rack of a 300° oven and bake until a knife inserted along the side of the custard dish comes out clean. So that's baked custard. But I actually have another dish for you, too. 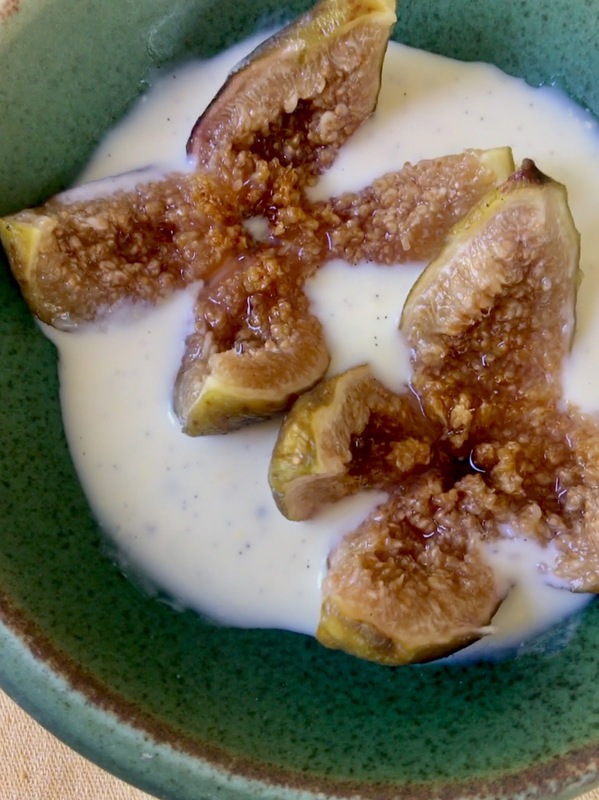 With figs in season I thought I'd play with poached figs in a custard sauce. This custard is cooked stovetop. It's more labor intensive and you'll get a bit of a steam facial but the flavor and texture are so marvelous it's worth it--and can be done in advance if you're entertaining, then put together when you're ready to serve it. Instead of a bain marie, you'll be using a double boiler. And now you risk the curdling. So, what you'll want to do to avoid that is cook the custard over, not in, the boiling water in the lower pot so it won't get too hot. Stir the mixture constantly. Cook only until the custard leaves a thick coating on the back of a metal spoon, then remove it from the heat to keep it from cooking. 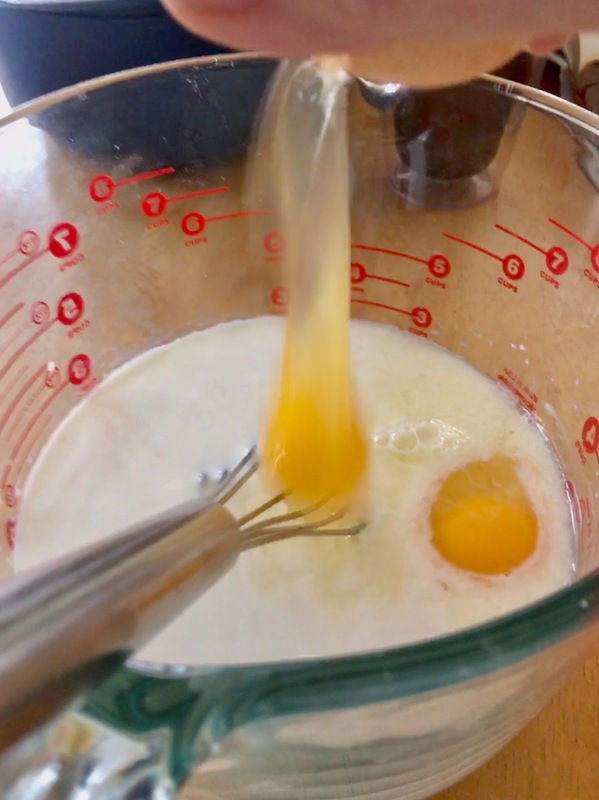 If worst comes to worst and you see streaks of scrambled eggs, you can either pour it through a fine sieve into a bowl or pour it into a blender jar and process it until it's smooth again, then return it to the heat. 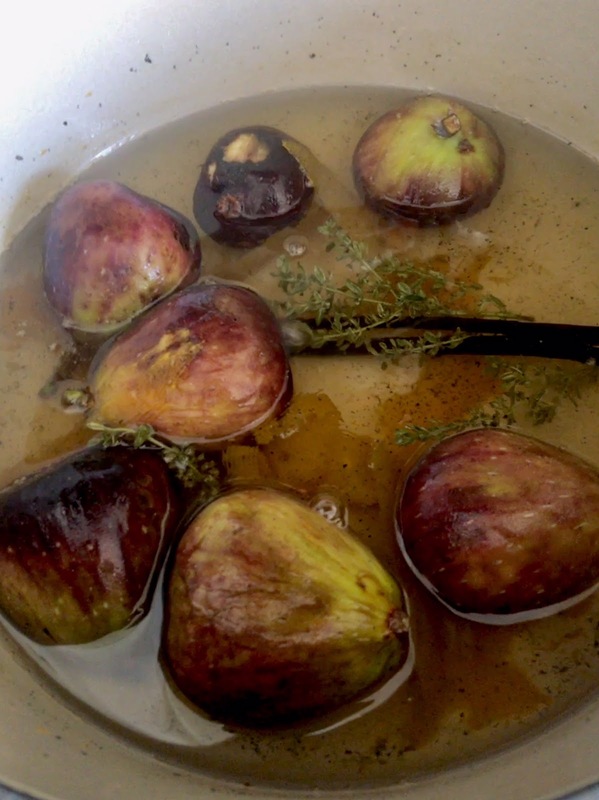 For the figs, poaching is a dream. 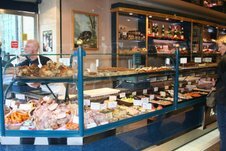 You can riff on the liquid flavorings--using red or white wine or a dessert wine or water and juice or even balsamic vinegar. Add sugar, perhaps herbs, vanilla, or citrus zest. 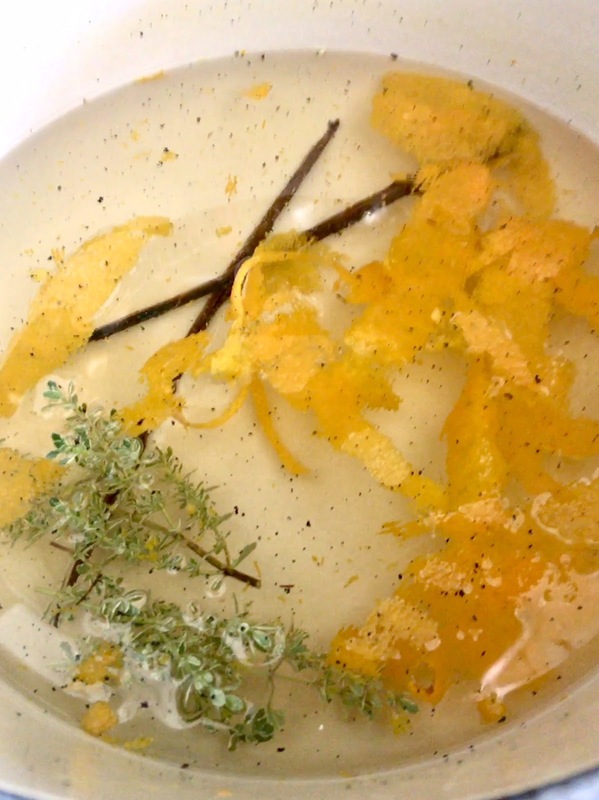 I focused on orange, with a syrup made of cointreau and orange zest. The flavor perfectly complements the vanilla custard sauce. Combine the ingredients, bring to a simmer for five minutes, then add the figs and simmer for another five minutes. 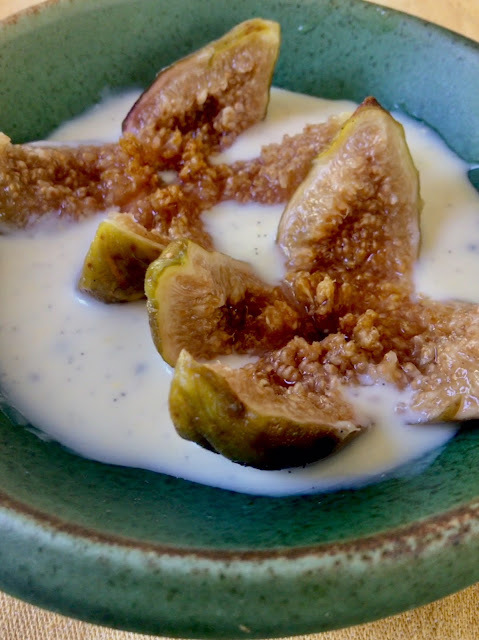 If necessary turn the figs as they're cooking to be sure the figs poach evenly. Then remove the saucepan from the heat and let the figs cool in the syrup. Mix together the milk, sugar, and salt. Add the eggs and beat well. Then add the vanilla. 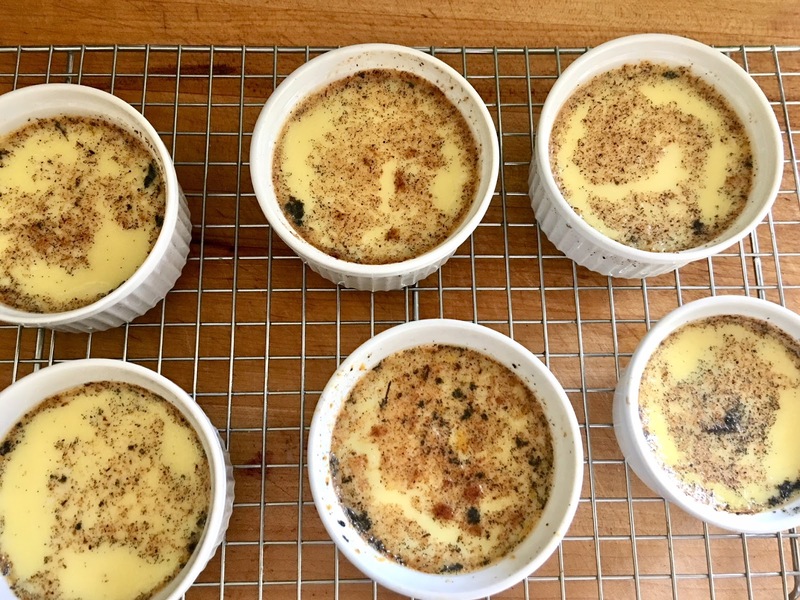 Pour into a baking dish or individual custard cups. Dust with nutmeg. Place the custard cups or baking dish into a heavy ceramic baking dish and add hot water until it reach halfway up the sides of the custard containers. Carefully place in the oven and bake 30 minutes (longer for a single large container of custard) until a knife inserted near the edge of the cup comes out clean. The custard may still be wobbly but it will continue to set up as it cools. 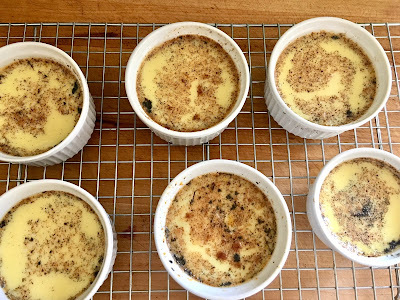 Remove the custard from the oven and the custard cups from the bain marie. Set on a rack to cool. Then chill.